In October 2014 I was delighted when Château Pichon-Baron, one of the most illustrious Cru Classé properties of Bordeaux, sponsored a competition here on wine-pages. It offered one lucky winner and their friends a true, once in a lifetime opportunity. Over 5,000 people entered for the chance to win a two-night break with exclusive use of the château for their party of up to six guests. Included would be a lavish private dinner with the Château’s wines, and a private tour and tasting not only at Château Pichon-Baron, but at sister property the Premier Cru Classé of Sauternes, Château Suduiraut. 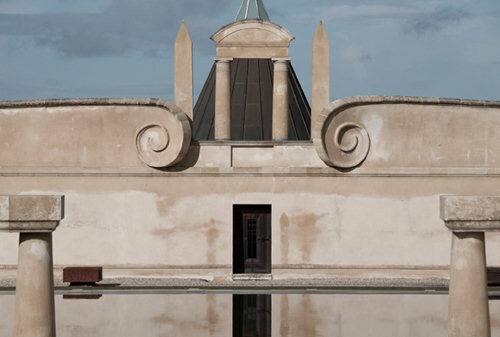 I was the lucky person whose name came out of Tom’s virtual hat to win this fantastic competition: a weekend at Château Pichon-Baron in Pauillac. 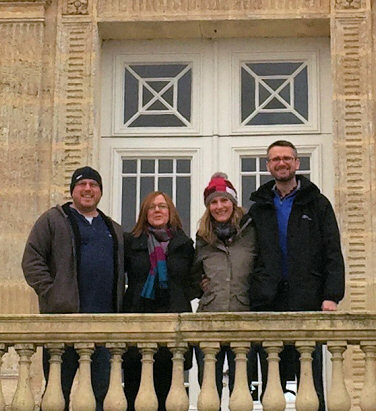 Six of us headed to Bordeaux: myself and my wife, my best friend and his wife, and fellow wine-pages regular David Crossely and his wife. Right: Anthony (left) with some of the party. Arriving separately on the Friday evening, we met up at Pichon-Baron before heading out to a local restaurant in St Julien, aptly named ‘Le Saint-Julien’ (this had been recommended by both the Château and Tom from his recent visit). A lovely dinner was had by all, including plenty of game and fowl on the menu. Some had pigeon, others guinea fowl, and the local lamb was enjoyed as well. Two of us actually claimed to have eaten the best pear dessert we’d ever had. The wine list at Le Saint-Julien isn’t extensive, with few older vintages, so we began with a Pol Roger Champagne, followed by the Châteaux Gloria and a Fleur-Milon, both from 2007 and both OK, but nothing more. The assiette de fromages was actually only one cheese, a big spoonful of Mont D’Or. Luckily, one of the party loved Mont D’Or! We finished off with a rather lovely 1973 Armagnac to end a memorable first dinner. We piled back into David’s rental car for the short drive back to the Château, just in time to catch the last 15 minutes of England v Wales at rugby. I was rather a happy man sitting on the staircase, streaming the match on my iPhone. We celebrated the somewhat surprising victory with some billiards and port. The Château really is stunning, both inside and out. We stayed in rooms which were fully commensurate with the grandeur of this most beautiful of Haut-Médoc Châteaux, with the added luxury of having the whole place to ourselves: a large dining room (where six of us dined at a table for at least fourteen), three drawing rooms and a billiard room, as well as many hidden corners beneath the turrets, all connected by a long sweeping stone staircase. We went to bed that night, happy and anticipating what tomorrow would bring. As we ate breakfast the sun was out and there were bright blue skies, so we decided to take a stroll through the vineyards to neighbouring Lynch-Bages, where we had booked oa tour and tasting. The tour at Bages is quite forma but informative, and our questions were all answered by our knowledgeable guide. The tour costs nine Euros per person and is well worth doing if you are in the area. For the tasting, we had Les Ormes de Pez 2007 (from Saint-Estèphe, the estate is also owned by the Cazes family) and Lynch-Bages 2007. I think for being such good clients we were also offered a glass of Bel-Air, their white wine from the Graves. As the Blanc de Lynch Bages was not proferred, we bought a bottle from the shop along with a red 1998 – just in case it was needed for later. The Cazes family has restored the next-door hamlet of Bages as a tourist attraction in this area, so we headed there and to the Cafe-Bistro Lavinal, where lunch consisted of burgers, rabbit and fish soup, though we were just a bit disappointed at the stiff mark-ups on their wine list considering where most of it had come from! After lunch we headed up to Saint-Estèphe for a tasting at Haut-Marbuzet. 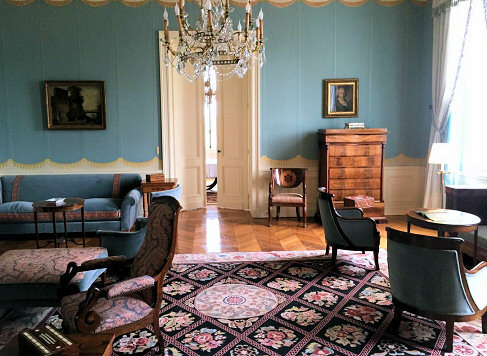 This estate is run by Henri Duboscq, whose family has owned the property since the early 1950s. It was one of the original nine ‘Cru Bourgeois Exceptionnel’ that were declared in 1932. Set between Cos d’Estournel and Montrose on a plateau, one can understand why many consider Haut-Marbuzet to be of Cru Classé quality. We enjoyed a slightly less formal (and free) tour here, just the six of us for whom our host generously opened five fresh bottles – a Duboscq Médoc, Chambert-Marbuzet 2011 (a Cru Bourgeois of five hectares), and the Haut-Marbuzet itself from 2007, 2011 and 2010. We left armed with a few bottles of the 2010 and headed on back ‘home’ to Pichon-Baron in time for our 5pm tour and tasting. Our main contact at Pichon was Nicolas Santier, Responsable du développement réceptif et tourisme for the Château’s owners, AXA Millésimes. AXA also owns Suduiraut (in Sauternes), Petit-Village (Pomerol), Pibran (also Pauillac) plus famous estates in Burgundy, Tokay, the Douro and Languedoc. When they took over Pichon-Longueville in 1987 it was rather run down, but they have completely restored it. 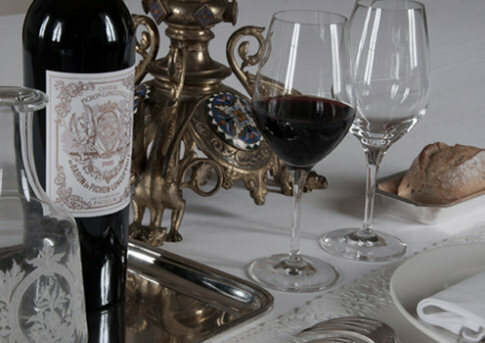 Today it’s used for occasional hospitality – important people such as clients, wine writers and now, us! With Nicolas we toured the wine making facility, which is located underground in front of the château – in fact the barrel room is directly under the lake in front of the building. There are windows in the ceiling of the barrel room, so when you look up it is through the water to the sky above. The architect responsible was given carte blanche – and had a field day. It really isn’t your normal cellar, and apparently not everyone is a fan of the Blue Pyramid that lights up at night. We headed to the tasting room, which wasn’t quite what I expected: it was very modern, almost a Napa-style tasting room. We settled into our chairs to be treated to a selection of beauties including the second wine ‘Les Tourelles’ 2012, The Pibran 2012 and the new second wine from the Grand Vin vineyard called ‘Les Griffons’ 2012 (emphasis on Merlot). Then onto three vintages of the Grand Vin (2009, 2010 and 2012). Needless to say, all were exemplary. A couple of us preferred the more fleshy 2009, but the majority were blown away by the 2010 – especially its drinkability now. We look the leftovers back to the Château, where we polished them off along with some lovely canapés in the billiard room watching the second half of the France v Scotland rugby game along with a couple of glasses of Champagne Jacquesson 737 as an aperitif. Soon it was time for dinner. Scallops and Sweet Potato purée was accompanied by a bottle of the dry white ‘S de Suduiraut’. Next up was some local lamb along with 2003 and 2004 Pichon plus the 1998 Lynch Bages. No cheese course somewhat surprised everyone (No cheese course in France!) but dessert made up for it: a pineapple, kiwi and cream concoction that was delicious with a bottle of Suduiraut Sauternes 2005. The chef came out to introduce each of his courses: he seemed very young, but his cooking was top notch. The evening finished up pretty much as the one before with billiards (of sorts) and a few more glasses as we had to dispose of the Lidl own-brand Armagnac I had hastily purchased to bring along. After breakfast next day we had to sadly depart ‘our’ Château, where we had been the sole occupants for the weekend. We headed into the city of Bordeaux for some sightseeing and lunch, before taking flights home to our various locations. A very big thanks to Nicolas Santier, Patricia Dore and the rest of the staff at Pichon-Baron for their hospitality. They really did make this great weekend a once in a lifetime opportunity. And of course, thanks to Tom Cannavan for arranging such an amazing competition!